I got to Oregon City, thinking I would have to clean gutters and blow leaves around, but nope! The colors are still hanging on the trees! In fact, many of the colors are still green! I even have tomatoes on the vine, and new tomato flowers! Not that they'll produce, but still! There is the feeling of summer, lingering in the air. The tank top afternoons don't remind me of Fall so much, either! But, yesterday morning, I got out my kerosene heater and lit it in the garage, while working. There was a definite Fall chill in the air! Now, that reminded me of winter, for sure! I have tons of crafts out here, and on very special winterish days, I light my heater and spend all afternoon creating things! At the Kilchis house, David's old bedroom is now our fly tying and crafts room. I haven't spent much time their, yet. (In the craft and tying room) but, I can definitely picture myself getting lost in projects there, also. And there, I even have heat! I'm off to go search for chanterelles with David, this morning. I have a new entire forest to search. I can't wait! It's difficult to write, today and to be cheery. Every exclamation mark feels a bit forced. Yesterday was tragic for so many people. God Bless and carry the people of Oregon and all of their friends and families. The tragedy of these shootings are happening far too often. It's not time to talk about gun control, in my opinion. At least, not yet. Let's love the people affected and wrap our community arms around them. We had plans to fish today, from way back to last week. Argh. Here I sit at my computer, wondering what it's like to fish! What is it like, you guys? To sit on a boat, with the waves, rocking you back and forth, watching the tip of your rod work with the rotation of the blades. I can see it in my mind! But, this isn't a vision problem. This isn't about my wellness. This is about Jennie the nurse. He is the almighty care taker! When I arrived, I noticed a bad cough, every time he turned around. "Bill? Do you have a cold?" He didn't think so. He does, and it's bad! But, he was going to fish, by golly! There was nothing going to stop him from getting me on the water! Nothing could stop us from fishing... except for animals. They come first. Molly has been suffering all weekend, waiting for her leg to either get better by today, Monday, or to go to the vet. She is going to the vet. 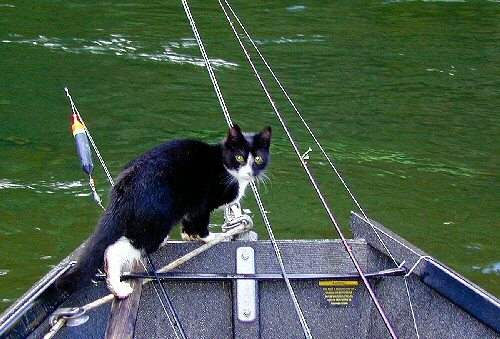 I mean, after all, fishing season will start with the rain, and how the heck will she be able to fish, if she can't jump on my shoulder? She is getting older, but by golly, she can still get on my shoulder! 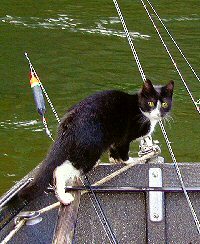 That silly, silly fishing cat! Poor thing has been hiding under the bed, or behind doors, so that the dogs won't bump her. My heart is heavy for her. I hope it's not broken. I have no clue what has happened, nor does Bill. But, she needs to go to the vet, and by golly, we are taking her! Bill is pretty ill, also, and really shouldn't be out on the river, but it is Molly who made the decision for us. I love that cat so much! She even has her own fishing bell! It's 7:13 in the morning, and the sky is a hilarious bright pink and orange! It's amazing- Like it's on fire! Here they have those moon eclipses and red moons and all that- that we get so excited about, but no one can predict these amazingly colored skies! And by 7:15 it was gone! I glanced down at my blueberry bushes that are all dressed in their Fall fashion colors, and glanced back up, and the sky show was over! My Bill was really sick, yesterday. I hate to leave him like this, but I have things to do in Oregon City for a couple days, including a Doc Appointment, Monday. After that, I'll be back. Today was one of those days I woke up out of a deep sleep with a heavy feeling. What was it? I searched the cobwebs in my mind, for something stuck, like a fly being wrapped with webs to be eaten. I wish it were eaten and gone! I wrote about it on Facebook, before I really thought about it, much. I tried so hard to not feel sorry for myself. Now that I've processed it, the "sorry" is mostly gone. It just is what it is. Here's what I posted. I edited it a bit. "Ugh. Just found out that since my aortic dissection in '95, it has grown 5 mm. I was extremely lucky to live thru that. Every year I go get a CT or an MRI to get it checked and measured, and each year, it's only grown 1 mm. That sounds great until you add it up! Six months ago, they told me I'd need to have surgery. I promptly and conveniently put that out of my mind till my appointment this Fall. Weeeeell, now the two surgeons together think it will take TWO (count 'em!) 6-8 hour open hearts to try and fix the rest of my dissection. He said the surgeries would probably be 6 months to a year apart. One opening my chest, and one going thru my side. These are serious, high risk surgeries. I just got off the phone with Dr. Song, my thoracic surgeon. So, do I do it, or do I just go on as normal and conveniently forget this news?! I wonder which is the greater risk? To live without the surgeries and risk rupture, or to do the surgeries? I'm not getting any younger and my ability to heal is not as good, now. Pheh! I don't know what to do.... I don't have to decide now.... But he wants me to do it in the next couple years for sure... And every day I live with the risk of rupture until I do the surgery. But then again, the surgery could take me, too! Isn't there a third option!? Ticks me off. I am too busy loving life to take time out!" So, it is what it is. I have an appointment on Nov 11th, to talk to the surgeon. We'll just see what God decides. That's what. He doesn't forget like I do! As the rain fell, I stopped for a moment and listened to the earth absorb it. It really was making slurping sounds! Some of the grass in my lawn looks totally dead, but those spots were having so much fun drinking up the moisture! In celebration, I bet that there will be grass there, soon! I watched torrents of water pour out of my gutters. The earth was so dry and hard, beneath the spouts that the water spread over the earth, having trouble absorbing it all. Thank goodness David cleaned the gutters for me, last week. I think it will have to be done, again, due to the falling leaves this weekend. Oregon has had a little scare or drought this year. At least, it hit me that way. Water is such a precious commodity, but due to the normal abundance, I think Oregonians forget that from time to time. We have so much of it, that on 'yet another rainy day', it is shamed, blamed, and crossed out as a bad day on the calendar. As we get older, we become fair weather fishermen, many of us. "Can't fish, today! It's raining!" Wha? I grew up fishing in the rain! If you fish, you have no choice, normally! But, I said to Bill the other day, "We used to fish in the rain! Why can't we still?" In my fifty five years of life, I can never remember a summer so dry. And I look at the weather forecast, today, and I see sunshine in most of the days future. Will the Kilchis river ever rise? I mean, really rise? So that salmon can come up to spawn? So that I have to move my canoe for the winter? We were supposed to have rain this weekend. When they forecast rain, normally, we have it in abundance. Yet, this weekend, there have been plenty of times I've been able to get out to walk Willie, during breaks in what i see as a feeble rain. I guess a couple times it really came down, but all in all? It wasn't an Oregon rain weekend. It was sparse. We need rains that scare away the fair weather fishermen! We need rain that makes people who used to live in sunny areas of the US, go plum crazy! In order to live in Oregon and to enjoy the beautiful green of our state, you need to be able to handle the rain, the rain, the rain! Yet, if you just moved to Oregon this summer, you might think you can handle it! Let me tell you, this summer was not a good example of what Oregon is really like! Just ask my plants. They have lived through many years in Oregon. Plants don't normally speak, but yesterday? I could hear the earth slurp up the rain in appreciation. They thanked the sky! I could hear them! I have rhodies in the front yard that look like they might actually die, due to a lack of water. Oh, did they love this rain! I have never had to water some of the other bushes in the yard. This year, I drug the hose wayyyyy over to water things that don't normally require me to stretch the hose that far. Those were the ones I imagine loved these showers the most. You know, I have the best memories of fishing in the rain! I think that after this summer, I may have learned a big lesson. I think that as I grow older, I am going to refuse to be a fair weather fisherman. I think that I am going to love and appreciate and learn to endure the rain. I did it before, except I did it because I was youthful and could sustain anything. I doubt I'll enjoy it physically, (it gets cold!) but mentally? I'm going to appreciate fishing in the rain. Who watched Gold Rush, last night? Pete, Bill and I had fun watching the two hour special while enjoying a wonderful Chinese dinner! Tillamook has the BEST Chinese food I've had! It's fun to watch the Gold Rush fans come out of the closet! Are you one? Whoop! Gene is working for... WHO? That makes me so sad! I bet is doesn't work out! I bet he goes back to Parker! Oh! Remember the S.H.IT tourney in the Fall? I recall way back when it was a mens-only Tournay and Kim from Clam Gulch (God rest her soul) and I put up a stink about that! Oh, the good old days! Now it's the S.H.O.T. tourney and the Steelheaders have taken it on. Click here to see! It sounds like a whole lot of fun, but I'm not in it this year. One day, a month ago or so, Bill stated, "Mark the 15th-17th of October on your calendar. You are fishing in a tournament." Just like that! I considered it. I really did. But, not only am I not good for all day fishing anymore, (let alone two days of all day fishing!) I'm just not that into salmon fishing, as much, anymore, and I've certainly never been much for tournament competitions. My aorta can't withstand too many more salmon fights, the doc says. Oh, I know... these tournaments raise money for a good things and they are an awful lot of fun, but... I fish for quiet... for peace... for solitude! My decision was made after I took care of Bill while he had the crud two weeks ago, and then I came down with it, myself. Blech. I was not fishing, and I had no choice! Still suffering with that "awful coughful" all night long. rest was mandatory! Teehee... Was going to write an overly ethical excuse of a piece against tournament and competition fishing and all that, and end it with a picture of a big salmon that I caught, and ask if I won. Ha! Instead... turns out I was the only one on my original team to catch something! And it wasn't a head cold! Yesterday, while dusting off my 4 weight in the fly tying room, I decided I had enough energy to cast that sucker. I I tied on a rather frumpy looking spruce fly, slowly made it to the river, and stood at the water's edge. It was one of those crispy leaf days. You know where the maple leaves fall and they even crunch while landing on water? It was beautiful! Not too many leaves.. just 10-20 crunching and floating around the pool. The pool where the fish live... muhahaha. The dogs were oh-so-happy that Mom was feeling a bit better! They ran around on the rocks, their tails wagging and then swimming in the water before me. Willy was standing about two feet deep in front of me for my first cast. "Move, Willie, move!" He moved deeper into the water, towards the fish. More reprimand as my flimsy fly rod took the workout, and then Willie moved up on the (usedtobe) dry rocks, to make the dried moss slippery as all getout. Of course, I fell. Fish still on! "Move, Willy, Move!" He licked my face. I couldn't help but laugh through the pain and slobber. Everything from the rocks to the fish to his slobber was lickee-fish-slicky! Finally, a 12 inch resident cutt came to hand! I was down on all fours, but I reached out, soaking the arm of my shirt, and I released him! YAY! YAY! YAY! Jennie! I WIN! YAY! YAY! But, not only did I catch the only fish of the day, says Bill and Pete, but I got to hold in my hand- but for a brief second, the most glorious- red striped, most beautiful resident cutthroat in the Kilchis river! I remember way back when... I was playing in a piano competition at Portland State. It was not peaceful, not relaxing... yet that's what you would think people play music for. Anyhow, I came home and told my Dad, then the Canby High School athletic director, "Dad? I think I'm competitive." I had enjoyed it, no matter the stress! I was never athletic, but somehow I think at that moment, I became a real member of his tribe. Dang, I miss my Dad. One of the problems with having serious health issues, is that having colds, flus, etc., just adds to the down time. Ugh. Not that I'm immune to this stuff, but I've certainly slowed down on catching things, since my kids aren't little, any more. The term "sick" to me, means broken things. Broken muscles in my eye, in my aorta, etc. I guess I should be thankful nothing is broken! I went to Tillamook to help Bill get over a 'coastal crud' episode, and he almost never gets ill! The gift that keeps giving... He was so kind as to share it with me! Either that, or when we took him to the doc, they poked me with shots for flu, shingles, and pneumonia. I stopped getting flu shots about 20 years ago, when two years in a row, I got sick right after my immunizations. I thought that I was catching it from the immunization. Who knows? Regardless, I caught the crud. Hacking, coughing, feverish, headache, nose blowing CRUD! Crud! I should own stock in Kleenex. I think I'm finally over the largest part of it, but my strength and endurance seems so low. I tried to take a walk with Willie yesterday and had to stop multiple times, just to catch my breath! I put up the Kwikfish contest, you guys, so get your entry in! I can't wait for this year! I'm going to be in the Rapala booth at the Pacific Northwest Sportsman's Show, thanks to Carmen. This is going to be fun! I'm refreshed and ready, this year, so come on! Let's color! Have you seen those new coloring books for adults? I want one so badly! And pens, and pencils and it just looks so fun! It's all the rage in the arts and crafts stores. In fact, I bought one for Tammy for her Birthday. I wanted it, so badly, all for myself! LOL. I've been going through all of my old pictures, posting fish to my Facebook. 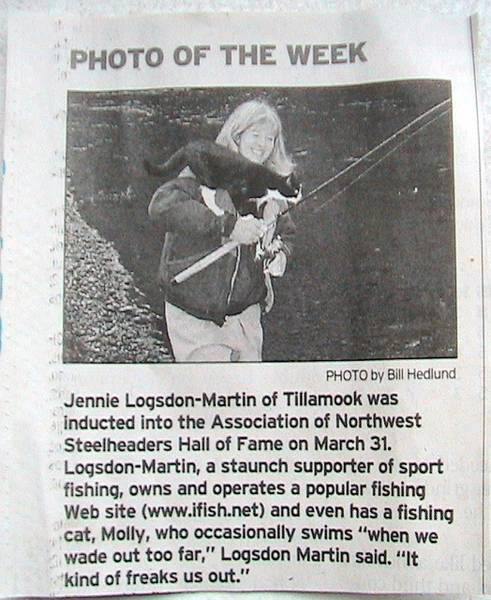 (It's ifishjennie) I cannot believe how many fish I've caught in my past, and yet now? I'm Fishless Jennie! Eh hem... someone once wrote a poem about this, and I'm going to share it, here. It's true! LOL.... I can't believe Stan can write those things so quickly and easily. I miss him SO much! Well, off I go. Today is Girl's Day and I get to have my hair done! Whoop! It's 4:28 in the morning. I do this. I start to wake up way before the break of dawn, as winter approaches. I think it's due to fifty five years of a cycle where at this time of year, we "fall back". But, I'm falling back on my own, and this is NOT going to work out! I do this! I do this every darn year! Not only do I wake early, but I wake extra early! Not only that, but I do that annoying, "Oh. It's 5 in the morning, but it's really 6!". I usually start that a couple days after Daylight savings. Not before! Oh, not before, please! This particular morning, I woke feeling pretty darn good! I got out of bed as per usual, and headed to the kitchen to make coffee, feed Sargie, (who was well pleased that feeding time was early!) and get Willie his treats. I believe that everyone should be treated in the morning. It's a wonderful thing, morning is. Everything is fresh and new and ... early! I walked to the stove to check on the time, as normal, and I squinted my not so good eyesight at the microwave. Oh, it couldn't be! I squinted again. It continued to glow 4:14. Someone must have left the timer on. That's the timer. Not the time, right? Darn kids. Clear the timer when you are done! I randomly pushed a couple buttons to get it to clear to the real time. Civilized people do not get up before 5, and richly civilized folks, not before 8. Well, unless you are a farmer. Farmers can get up early and still be civilized. 4:15. It changed to 4:15! This is not the timer. This is the actual time of day. Do I go back to bed? I instantly got that guilty feeling of getting up too early on Christmas morning. That feeling of being the annoying child. "Go back to bed, Jennie!" I used to hear that coming from my parents bedroom. I think back to that desolate time of being up before cartoons on Saturday. Now, they play cartoons 24.7. No one else was this excited to start their day. Just me! The rest of the kids in my family would sleep and sleep and sleep. How did they do that? I was always that kid who couldn't sleep in and I used to get a bit frustrated by eager attitude. My mind is churning, now. Are all fishermen and women those affected kids that can't sleep in, in the morning? Are we made up of hyper people? I recall the winter ski bus and how hard my parents fought to get the rest of the kids up and ready for the ski bus. It wasn't for lack of passion for skiing, either. They loved skiing! They just couldn't start! The odd thing is, is that I thought my early morning thing was wearing off. I was beginning to enjoy late nights. I can't really make it through a full day, and late afternoon naps were keeping me up later than normal. Because of that, I'd sleep in later than normal, but I think that's only when I'm ill and not feeling normal. I've been sick lately, and this is the first day I have felt good. I just so wish I was at the coast, so I could sneak out with my fly rod and catch the early morning bite. But, no... I'm in Oregon City, and the only thing I can think to do is to go out to breakfast with my sister. My sister Teri is my early morning friend. She rises early, and goes out to breakfast. Maybe I'll text her and see if I could meet her. I mean, I'm going to get all my ifish work done early this morning, and I'll have plenty of time, after! Oh well. It's going to be a beautiful day, today, and I get to watch the sun rise! I have really been enjoying all the Fall colors. I just wish I knew where to fish here, locally. I have never learned where to fish, here. I used to know, when I grew up, here. But, things have changed so much! Well.... Early or not, here I come! This is going to be a very, very long (but beautiful!) day! Good October morning to all! How do you like this wind and rain? I love it! I can't wait to put my boots and rain clothes on, and go stomp in puddles with Willie! I mowed the lawn, yesterday and it was all pretty, green, and clean from leaves. This morning? I can't see green at all! It's totally covered with leaves! Well, I'm glad that I got one final mow in. I also trimmed my tomatoes, yesterday so that the remaining nearly red ones, would get a chance to turn color. I think that was fruitless, so to speak! They are going to split, this weekend, for certain. :( Oh well. I had a wonderful crop this year. It's just that I didn't need to spend an hour trimming, yesterday! Like I said, so to speak. "Fruit-less!" I am kind of bummed that I'm here in Oregon City and not in Tillamook. I wanted to stay this weekend for the trick or treaters, and a party for my nieces daughter. She's one year old, this weekend! Such a cute little sweetheart!! Plus, haven't seen my family in an age! I love this first real rain at the coast, and I will miss my chance to see those salmon jumping over the riffles at the head of the property. Darnit. Funny. I talked to a fly fishermen that I visit with each year. He told me he calls that hole that "Hedrun Hole". Funny! We all have our names for the different holes in the property, I guess. Our main hole that we fish most often, is what we call the "bedroom hole". This was adopted from the previous owners. Bill still calls the holes as they are. You know, the "Upper hole" and the "lower hole". I am, however, geographically challenged, and got these mixed up for the longest time. I'm still having to catch myself and think... UP? Down? I don't know why this is so hard for me, but I'm just not good at geography, whether it is on a map, on a road, or on the river, behind me!When I start thinking really hard about geography, and where I am, it makes me dizzy! That's what feeling lost feels like to me! No wonder I was bad at "Where's Waldo?" I can't even figure out where I am! I love the entries, so far, in the kwikfish contest! Have you entered your design? I keep seeing the color blue, this year. You know, I don't know about blue! Does it catch fish? I would think so! I can't wait to get back to Tilly, next week. I think the rivers will be in shape for my favorite thing! Putting in at the house, and drifting to the logging bridge, and if we feel good enough, shuttling from there, and going on down to 101! Whoo! It's been so long! I love that drift! I love watching over the bow to see chums, racing along side of us! We also like to put in at the house, and just anchor up in our super secret handshake hole! Now, there is a name for ya! Now, those are a few of my favorite things!